A user needed to add an event to two calendars, his personal calendar and a shared departmental calendar. He’s using Copy and Paste but wondered if there was a better, easier way. Office 365 subscribers have another option: Flow. This won't work in all situations as the the second calendar needs to be accessible in your mailbox in Outlook on the web. The calendar should be shared using Outlook on the web and you should accept the shared calendar invitation using Outlook on the web. Click on Connectors and select the Office 365 Outlook connector. Select the New event is created (V2) trigger. You’ll select your calendar from the next screen and click New Step > Add action. Select the shared calendar from the list of available Calendar Ids. Click the the subject field and enter the desired subject. Select Subject to use the event’s subject; you can also type something in the subject field. Do the same for the Start and End time. Click Advanced to set more fields. Click Save Flow to complete the flow. You aren't limited to using Office 365 calendars. 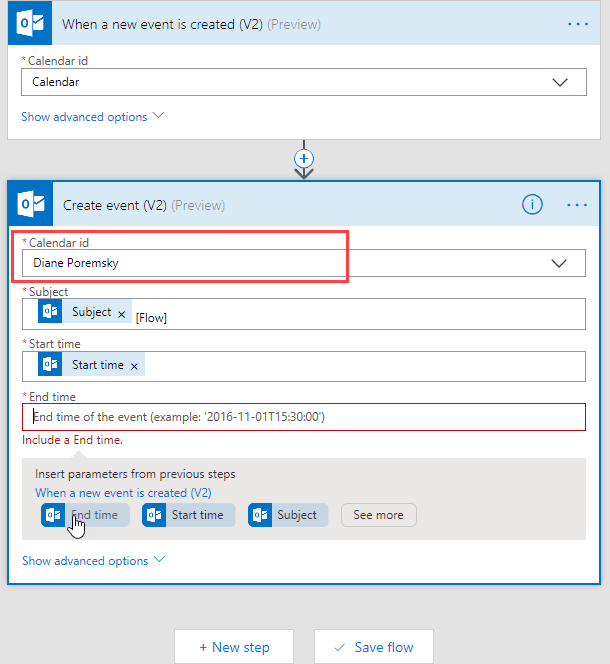 Flow templates are available to copy events to or from Google and Outlook.com calendars.